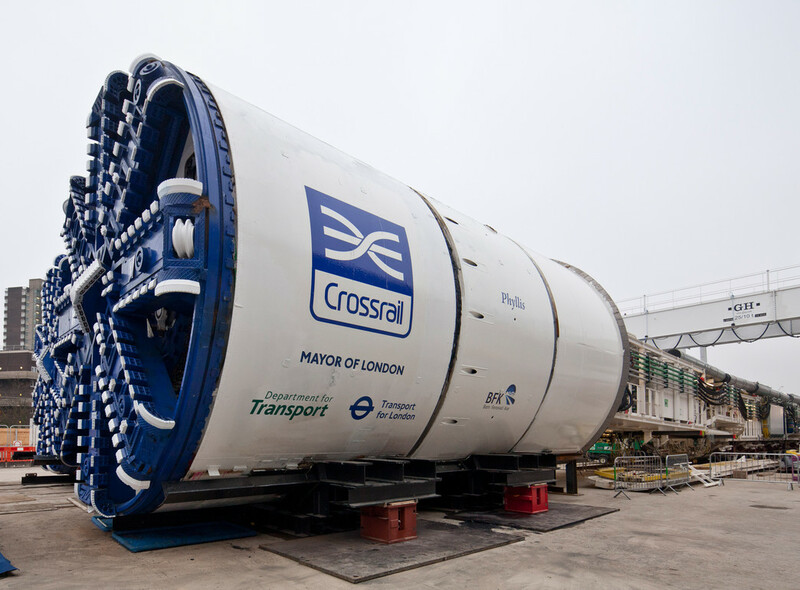 Meet our giant tunnelling machines - Crossrail . For information about the Elizabeth line please visit the Transport for London website. Digging the new tunnels was a 24-hour a day job, 7 days a week. Crossrail used eight tunnel boring machines (TBMs) to construct the new rail tunnels under London. The giant machines carefully weaved through the capital's congested sub-terrain, snaking between the existing Tube network, sewers, utilities, and London’s hidden rivers at depths of up to 40 metres. Like giant underground factories on rails, each of the custom made Crossrail tunnelling machines had an external diameter of 7.1 metres, weighed around 1,000 tonnes and measure around 150 metre in length – the equivalent of 14 London buses end-to-end and a staggering 143 buses in weight. Each machine has a rotating cutterhead at the front and a series of trailers behind housing all the mechanical and electrical equipment. The TBM is effectively a large metal cylinder with a rotating cutting head at the front and conveyor belt at the back to remove the earth. At the front of the TBM is a cutting wheel, which is pressed against the tunnel face by hydraulic cylinders. Inside the cutting wheel the disc cutters and scraping tool loosen the material. The loosened material is removed from the cutter head via a screw conveyor, which moves the material through the back of the TBM and out of the tunnel via a conveyor belt. The tunnel face is continuously monitored by pressure sensors that check the turning power of the cutting wheel and the screw conveyor, keeping track of the material that has been excavated. The TBM makes use of the concrete rings using hydraulic rams which are at the back of the cutter. Once the machine has moved sufficient distance the next concrete ring is installed. Crossrail’s concrete tunnel lining is designed to last 120 years. An in-built laser guidance system enabled the tunnelling teams to ensure the machine remains on course, ending up to within a millimetre of where it needs to be. During Crossrail's tunnelling phase, each TBM was operated by ‘tunnel gangs’ comprising of around twenty people – twelve people on the TBM itself and eight people working from the rear of the machine to above ground. The tunnel gangs worked in 12 hour shifts, tunnelling 24 hours per day, 7 days per week. Six earth pressure balance TBMs were used to construct around 18 kilometres of twin-bore tunnels through clay to the West and the riverbed deposits in the east, while 2 mix-shield machines were used to drive the tunnels through the chalk under the River Thames. 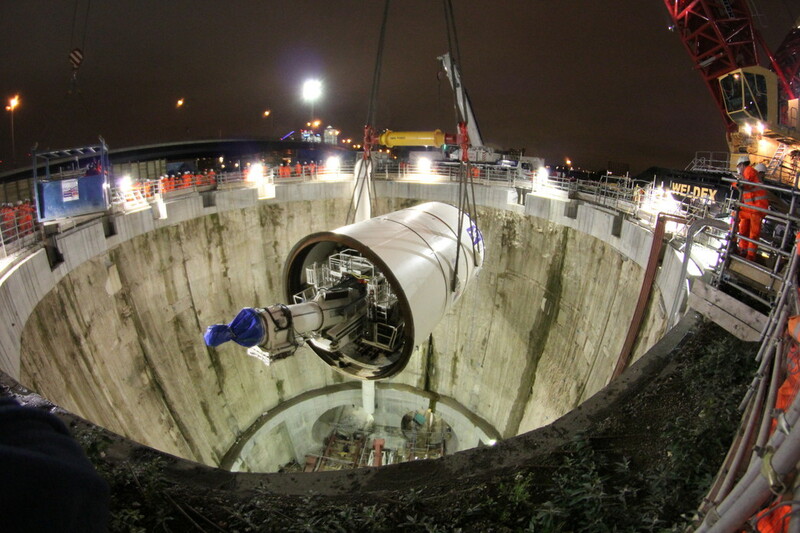 The eight TBMs undertook a total of ten individual tunnel drives to construct the new 6.2m diameter Crossrail tunnels. Royal Oak to Farringdon (Drive X): Crossrail's first pair of tunnelling machines, Phyllis and Ada, were delivered to Westbourne Park just west of Paddington, in early 2012 where they were assembled and tested ahead of launch in May and August respectively. The two machines tunnelled 6.8km each towards Farringdon, completing their journeys in November 2013 and January 2014 respectively. Limmo to Farringdon (Drive Y): Crossrail's second pair of TBMs, Elizabeth and Victoria, were delivered to Limmo Peninsula in London’s Docklands in summer 2012 and lowered 40 metres below ground in October 2012 ahead of their launch. Together they undertook the longest Crossrail tunnel drives, constructing 8.3km of new rail tunnels between Limmo Peninsula, near Canning Town, and Farringdon. Pudding Mill Lane to Stepney Green (Drive Z) & Limmo to Victoria Dock Portal (Drive G): Tunnel boring machines Jessica and Ellie were used to construct the 2.7km tunnel drives from Pudding Mill Lane portal, near Stratford, to Stepney Green. The machines were then dismantled, lifted out of the shaft and transported by road from Stepney Green to Limmo Peninsula, where they were relaunched to drive the 0.9km tunnels from Limmo to Victoria Dock Portal. These were the only machines on the project to undertake two separate tunnel drives. Plumstead to North Woolwich Portal (Drive H): In south-east London, tunnelling machines Sophia and Mary were used to construct the 2.9km long Thames Tunnel between Plumstead portal and North Woolwich portal. They were Crossrail's only mixed-shield, or "slurry", TBMs and at 110 metres in length are slightly shorter than our other TBMs. 42 metres at Finsbury Circus, near Liverpool Street station. According to tunnelling tradition, a TBM cannot start work until it is given a name. This tradition is carried out throughout the world as a sign of good luck for the project ahead. Since our TBMs operated in pairs to deliver the eastbound and westbound tunnels for each of the tunnel drives, we decided to name them in pairs. Our tunnelling machines were all named by members of the public following competitions run via our website. The first six machines were named after historical London figures, whilst the final two machines were named after modern day heroes. Ada and Phyllis (submitted by Emma Duncan, London): Ada Lovelace was one of the earliest computer scientists. She worked with Charles Babbage on his ‘analytical engine’, and is regarded as having written the first computer program. Phyllis Pearsall single-handedly created the London A-Z. A portrait painter, she got lost on the way to a party in 1935 and decided the maps were inadequate. She walked 23,000 streets, and a total of 3,000 miles to compile the map, delivering the first 250 copies in a wheelbarrow. Victoria and Elizabeth (submitted by Bryan Evans, Burnham): Named after the two Queens, Victoria was monarch in the first age of great railway engineering projects and Elizabeth is the monarch at the advent of this great age of railway engineering projects. Mary and Sophia (submitted by Ray King, London): Mary was the wife of the famous railway engineer Isambard Kingdom Brunel and Sophia was the wife of Marc Isambard Brunel who built the first tunnel under the Thames. Jessica and Ellie (submitted by students of Marion Richardson Primary School in Stepney Green): Students from Marion Richardson Primary School in Stepney suggested the names ‘Jessica’ and ‘Ellie’ for the final two of eight Crossrail tunnelling machines, which will drive the tunnels from Pudding Mill Lane (near the Queen Elizabeth Olympic Park to Stepney). Jessica Ennis-Hill and Ellie Simmonds were both gold medallists from the London Olympics and Paralympics 2012.